Our executive saloon cars are versatile, comfortable and secure. Rates are cheap, so why not book today? At Capital Cars, we consistently ensure that our customers travel in comfort in a friendly and safe environment. Something else that we like to focus on? Luxury. Our philosophy is that everyone deserves to travel in sophistication, and if you agree, you have come to the right place. Our fleet includes a range of executive saloon (sedan) cars that really allow you to sit back and enjoy the view in serious style. 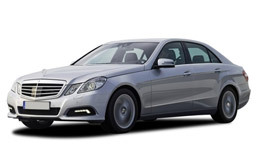 Our models include the Mercedes-Benz E-Class, Audi A6 and Vauxhall Insignia. These executive saloon cars will take you on any journey, from weddings and business meetings to day trips and airport pick ups. The affordability of our saloon taxi service will surprise you, and we will ensure that you are provided with the perfect vehicle for your needs. Remember, you can book online, over the phone or through our iPhone or Android Apps, so travelling with us has never been simpler. Our executive saloon minicabs can fit four passengers and a moderate amount of luggage, but if you need a bit more room, why not take a look at our people carrier and minibus vehicles? All of our cars are licensed by Edinburgh council and are maintained to a high standard. Book with us today, and start looking forward to the journey.